Dr. Donald R. Bobbitt began his term as president on November 1, 2011. Previously, he served as provost and vice president for academic affairs at the University of Texas at Arlington, from 2008-11. 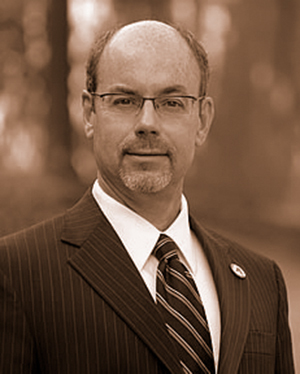 In 2003, he was named Dean of the J. William Fulbright College of Arts and Sciences at the University of Arkansas. After earning a doctorate in chemistry from Iowa State University in 1985, Bobbitt became an assistant professor in the department of chemistry and biochemistry at the University of Arkansas, Fayetteville. For five years, he was a recipient of the Camille and Henry Dreyfus Foundation Teacher-Scholar Fellowship, from 1988-93. He has received more than $13.8 million in funded support from national corporations and organizations — including the R.W. Johnson Pharmaceutical Research Institute, the National Institutes of Health, the National Science Foundation, the U.S. Department of Agriculture and the Howard Hughes Medical Institute. He is also the author or co-author of 56 refereed publications and has on several occasions been an invited speaker at meetings of the American Chemical Association. Personal: Bobbitt was born on October 21, 1956 in Philadelphia, Penn. He married Susan Cisson in 1980, and they have three children.